Day 7 of 30. Movie day! – 30 Day Detox… What?? Day 7 of 30. Movie day! I went to the movies!! My friend and her daughter took me on a movie date to see Beauty and the Beast today. We left early and went to church and caught an early showing of the movie. It was SOOO good! I’m definitely a bigger fan of the chocolate powder and prefer coconut milk in either flavor powder. It’s just a little tastier. Funny story about the movie experience. I think I agonized over the popcorn thing so much that I barely registered a blip of disappointment over it at the theater. My cohorts, however, both shared with me afterwards that they heard every bite and crunch of the popcorn and candy being eaten around them. My friend spent the movie feeling bad that I had to listen to it, but I was completely tuned into the movie and renedered completely oblivious. I ate some avocado for a snack in the afternoon when I got home, and, promptly, took a nap. I really needed it! I woke up to a sound coming from the direction of the kitchen. It was like a deep tapping, and I thought it might be my mom’s dog’s tail hitting a cabinet or something. I walked werry, werry qwietwy to the kitchen (now say that like Elmer Fudd), and found my mom working on dinner prep. She talked, yesterday, about also prepping some of the vegetables for the week, which (boo hiss!) I really didn’t feel like doing. She made it clear that’s what was going to happen this afternoon, however. We worked together for about an hour, she at the kitchen island chopping and crying over onions, while I took over cooking tonight’s dinner. Again, lots of peppers, and lots of mushrooms this time. 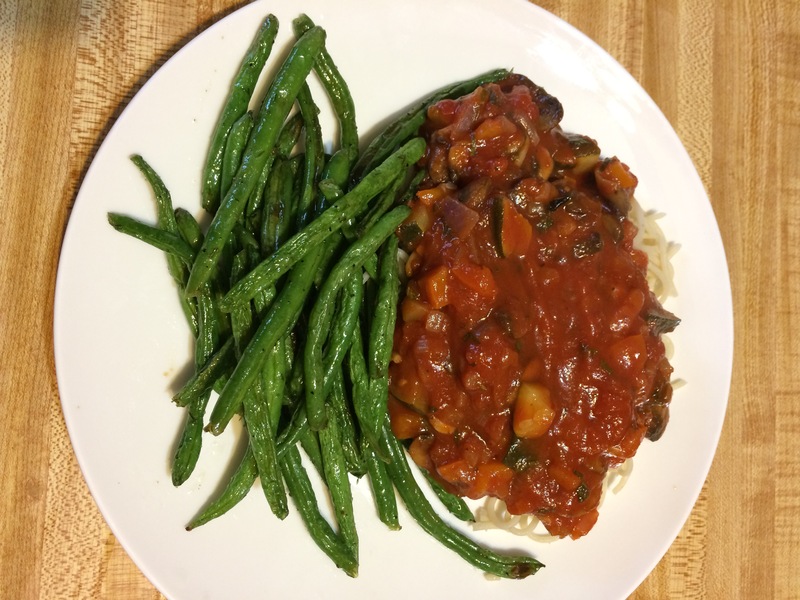 This is a tomato sauce loaded with veggies over brown rice pasta. On the side are roasted green beans flavored with a pinch of dill, garlic powder, onion powder, salt, and pepper; all tossed in a little sunflower oil. It looks like a lot of pasta, but it’s really a little pasta overloaded with sauce. This might be my favorite dinner so far. By the way, if mushrooms are at all a problem for you, like they are for my mom, I’ll tell you a trick to keep them from getting watery and gross as well as to remove the musty flavor. Here is your cooking tip of the day: Get your sauté pan nice and hot at medium high heat, add a tablespoon of oil and coat the pan. Toss your sliced mushrooms in. Do not add salt! This draws moisture from the mushrooms and they end up rubbery. Cook the mushrooms like this until they’re nicely browned, and they’re good to go. You can now add salt and other ingredients in or add the mushrooms to something else. For me, the texture of mushrooms can be a food killer. Cooking them in this way, and then adding to the sauce gave them a nice, tender texture. I’ve spent the rest of tonight hanging out with the family. Not a whole lot more to report. Today was a success. I faced a new challenge and succeeded, and got to spend some QT with friends and my mama. I’ll take it! Tomorrow is progress check-in day. I can’t wait to report any changes to you! Previous: Previous post: Day 6. Shopping day! Next: Next post: Day 8 of 30. Making Progress!